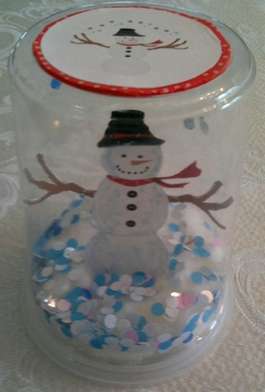 This fun and easy paper snow globe craft is so much fun to make! Use this craft to decorate for the holidays. And teachers – this is a great craft for the classroom. 1. Draw a picture of a snowman, Santa or another Christmas figure. You could also use a photo, as long as it is printed on paper that is stiff enough to stand up. Cut out the figure, but make sure you leave an inch tab on the bottom of your picture. Then fold the tab and glue it on the top of the plastic container (the underside, which will appear on the inside of the jar). 2. Take your plastic container top and glue on cotton balls. Separate the cotton slightly to give a more snowy appearance. 3. Take fun bright paper and use the hole puncher to make paper snow. 4. Take the bottom of the container and pour in your snow. 5. Now close your container and shake upside down and enjoy your snowy scene. Laura Koob is a self-taught artist who works with painting, sewing, and photography and has copyright images dating back to 1983.